These men's, hip hop style, Guess jeans have been languishing in my sewing room forever waiting for a good overhaul. The denim was pretty nice and there was a fair bit of it in those legs, despite the waist almost fitting me. I recall with a smile the skater boys sk8r boyz of the 90s getting about in similar ludicrous styles and thinking they were the beez kneez! It was time to do something with these and with the Aussie Sewing Guild's Castaway to Couture competition currently running, now was the time. Had I known how much work it was going to be I may not have embarked on this project. I nearly scrapped it halfway through when it was a shapeless, disjointed muddle, but I'm rarely one to give up on a sewing project so I pressed on. It took many hours, but I think it turned out alright in the end. 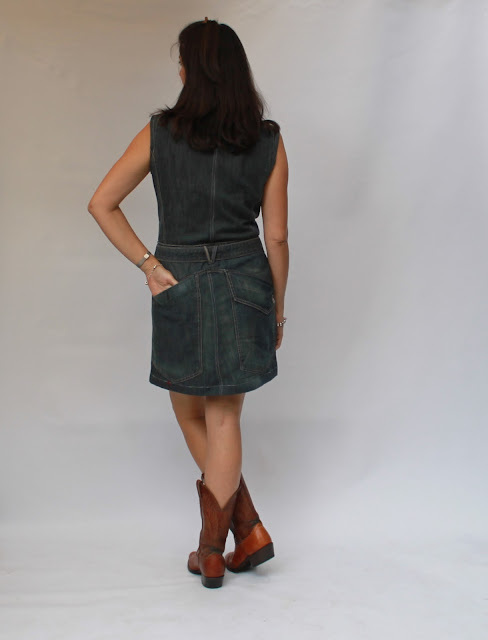 I believe that a successful refashion incorporates some features of the original garment into the new one. 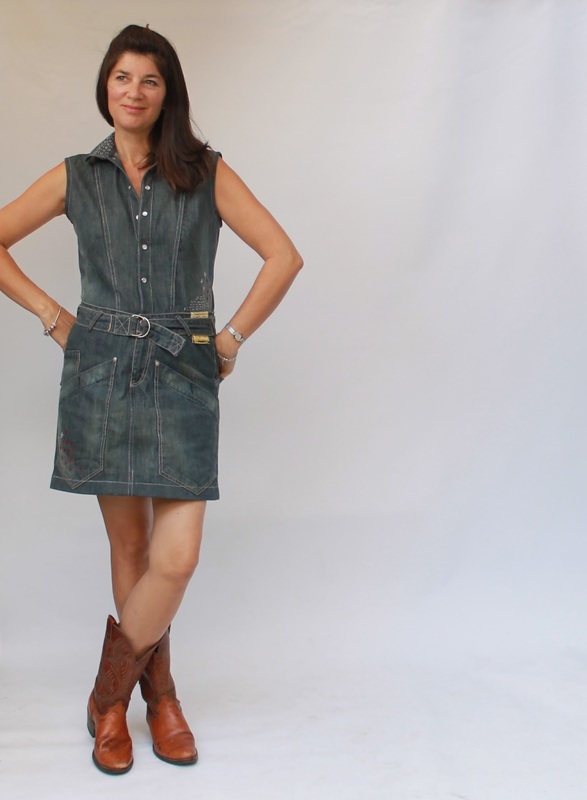 I wanted to make a dress from my jeans and, after contemplating many options, I decided to use the upper part of the jeans for the skirt and the legs for the bodice. I thought a front-opening bodice would tie in nicely with the skirt and I found this vintage Simplicity pattern with a zip front that I used to start me off. 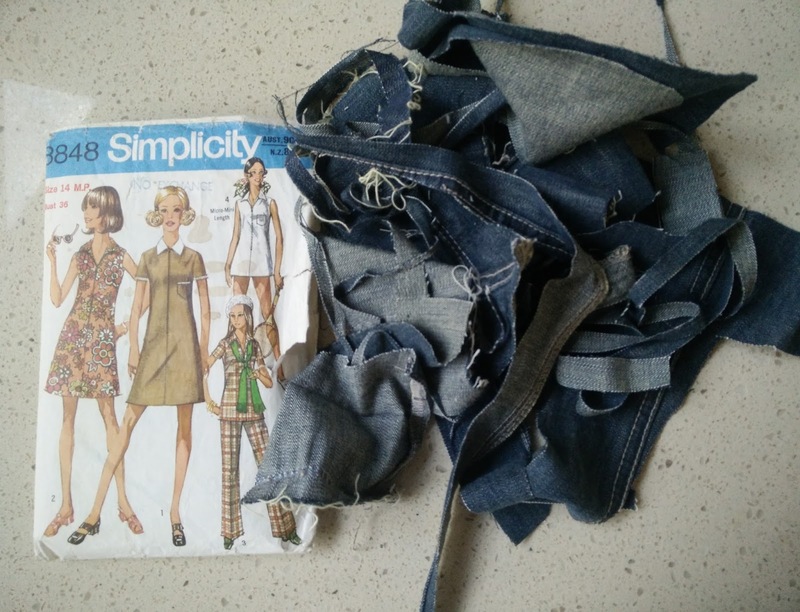 By the way, that small pile of scraps above is all I had left of the jeans when the dress was finished! My first step was to cut off the legs leaving enough fabric for the bodice and skirt in the two sections. That first cut was a bit scary. I then cut along the crotch seam so I could start forming the skirt. It ended up being really tricky to get the front and back centre seams of the skirt sitting nicely. I had to unpick nearly all the original seams to finally get it looking ok. Since the original waistband almost fitted me, I left that as it was. I managed to cut the bodice pieces out of the legs and the unpicked jeans cuffs became the collar. You can see the fading where the cuffs were originally turned up. I adjusted the bodice to fit the waistband, while still fitting me, and sewed the bodice to the skirt. The button stands were cut from small scraps and their insides were pieced together as there weren't big enough pieces left! I redid the unpicked topstitching on the skirt and used similar topstitching on the bodice seams to match the original as closely as I could. The armholes were finished with bias binding, from the op shop of course. 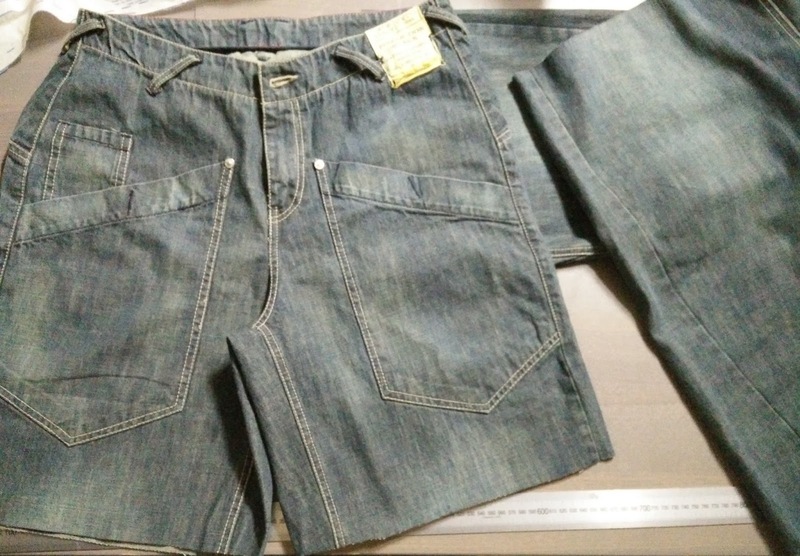 The seams above and below the armholes at the back are the original jeans seams. The final touches were the front snaps and some rustic sashiko-style stitching here and there (with op-shop embroidery thread) for some added interest on the plain denim. The belt is the original jeans belt. I just love those deep pockets. I can't keep my hands out of them! 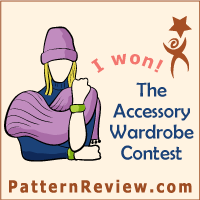 I am so pleased that this competition pushed me into doing this refashion as it's been ages since I did one. I really enjoyed how the process evolved and changed to suit the challenges imposed by fabric quantity and existing seams. I also loved using nearly every last scrap from those jeans and embellishing with recycled bias binding and thread. The five metal snaps are the only new thing I used. I am very happy with the final dress and I look forward to wearing it proudly! If you would like to enter the competition or see (and vote for) the entries, visit the Australian Sewing Guild Facebook page. You need to like the page to vote. Entries close 31st May 2016. I LOVE it! The dress is fantastic. It's a good thing that you took photos during the process, otherwise nobody would believe that such a great dress is a refashioned thing. I guess *upcycled* would be a more appropriate word here! Amazing work, amazing look! Ha ha! I was going to take more but I got too carried away with the sewing! Wow! 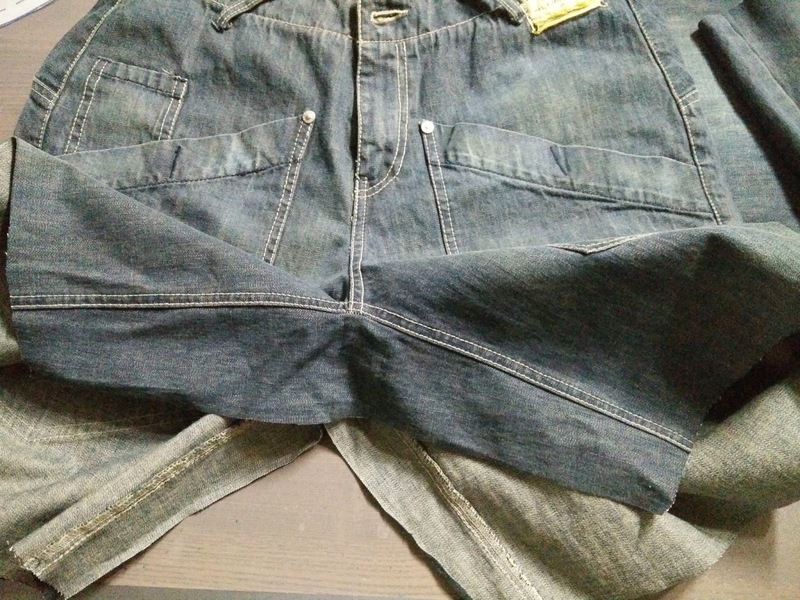 Fantastic job with the refashioning of these jeans. I just don't seem to have the talent to do that. Truly great fitting garment. Good luck on the competition. wow I love this and I would buy a pattern with this shape and details. Fantastic !!! That is fabulous. Your makes always impress me, but this one takes the cake! I am so impressed with your ingenuity. You've used the original seaming and pockets so cleverly that they are awesome design features in your new dres. There is no way that I could envisage this cute dress from those baggy jeans! Thank you so much. It took a LOT of planning! What a great effort! Using so many of the original details really put this recycled make into the stratosphere! You have great vision! That is a really amazing dress. You look fantastic in it. Inspired to go and look in my large refashioning pile again! Thank you and yay for inspiration! Megan this dress is so awesome. Your perseverance certainly paid off. I'm off to work out how to vote for you. Great! The best jeans refashion I have seen. This is freakin' amazing! You knocked this refashion out of the park. *hand claps* to the awesomeness! and a high five to you - thank you! 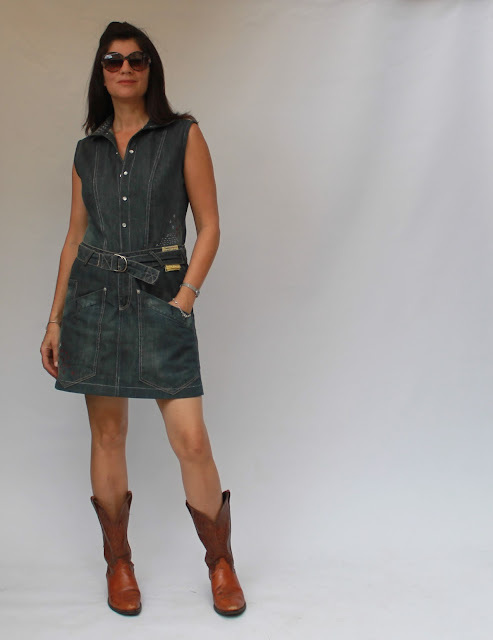 I have a bag of jeans from the op shop and now you've inspired me to do something with them - whatever I do won't be as good as this dress, it is truly wonderful. I agree with the anonymous comment above - it really is the best jeans refashion I've seen! 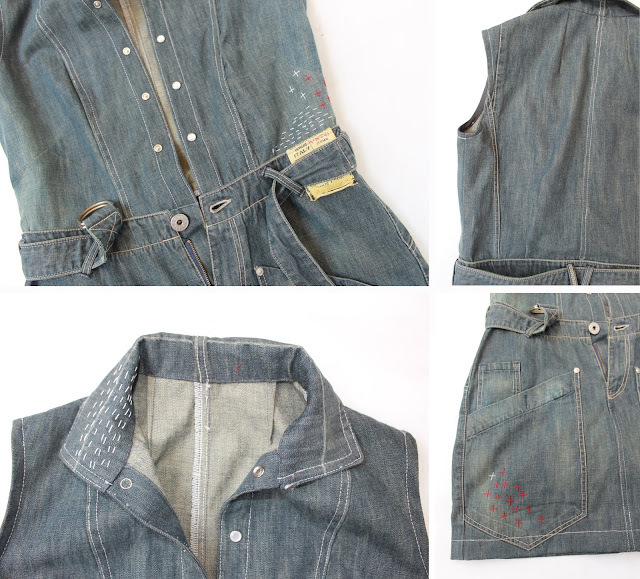 It's hard to go wrong with recycled denim. Be sure you show me what you make! Between you and Carolyn, I think they're pumping creativity into the water out west! Amazing and clever refashion! Ha ha, you are very kind. Thank you! I cannot believe you made that out of a pair of jeans! One pair of jeans! Utterly fabulous! It was quite surprising how much fabric there was in those jeans! Such amazing vision you must have, Megan. This refashion is fantastic. You have created a very wearable and stylish garment. Best wishes for the competition. WOW! I have to say that this IS the best refashion I have seen since following blogs. 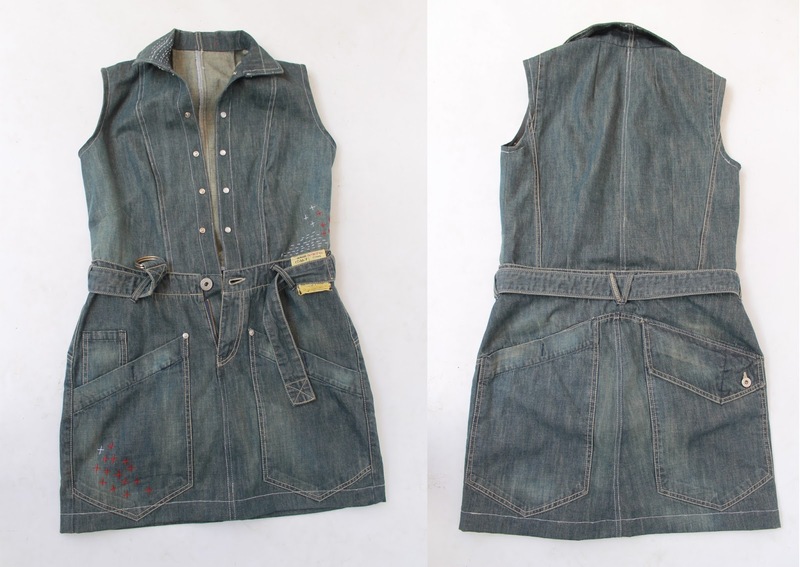 This looks like a high end denim dress you would find in the store. Great job! This is fantastic! I love the details! OMG, OMG, OMG! I don't know which is getting me more amped up - your fantastic refashion or that Simplicity pattern which I made at least 3 times in Jr. High!!! Green scarf and all! Oy, I'm old. LOVE your sloppy to svelte work. If you don't win I'm personally coming over The Great Water to stomp someone. Good Luck! Truly amazed, thus is a fantastic job and I think it also really suits you, hope you win. 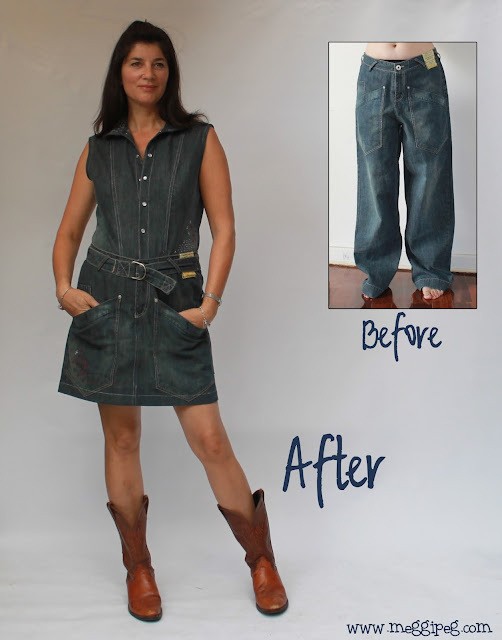 Beautiful refashioning project! Love what you have done! That is one very clever refashion. Good luck with the contest! This is wonderful Meg, what a clever refashion and it looks great on you!